My daddy collects motorcycles. He loves riding them too, mind you. I think this is a passion that he got from his dad, although I can’t say for sure. All I know is that ever since I was little, there always was a motorbike in our garage. Over time, my dad’s collection just grew, and he now has over a dozen of these 2-wheeled machines parked at home. He likes the big-engine bikes, not those racing motorcycles or the low-cc ones. His are vintage BMW’s and other large ones that I won’t even try to talk about coz I know I’m gonna totally sound like a girl. I remember there was this one time when my guy office mates came over just so they could take a look at the stuff in our garage. I don’t really understand bikes, but I know that dad’s collection is a pretty good one. Sorry, though, but I didn’t take a photo of any of his motorcycles for this post. I am sharing a picture of a pretty impressive motorbike though, one that was made out of forks and spoons. Okay, I don’t think I did a very good job with this photo because I couldn’t get the angle right. I really didn’t want to sit on the floor outside, and it was just too dark inside the house to take the photo there. I also used a point and shoot, that’s why my focal point is kinda iffy. And, as you can see, I didn’t bother to dust the figurine. Hahaha! Oh well. I hope you get it though. Like I mentioned, this is a motorcycle made out of spoons and forks, and it was given to my dad by the son of our cleaning lady. Galing no? We have three of these at home, and I hear that the guy has made all sorts of metal sculptures in various designs out of utensils. Amazing. Know what else is amazing? The fact that I’ve so far been able to post on time for this photo-a-week challenge. All but once, I think. And I’m sticking to it, too! It’s lots of fun for me because I get to do it with other mom bloggers, and I get excited over what they post each week. So, at least for this blog challenge, I’m not an incomplete blogger anymore. Yay! 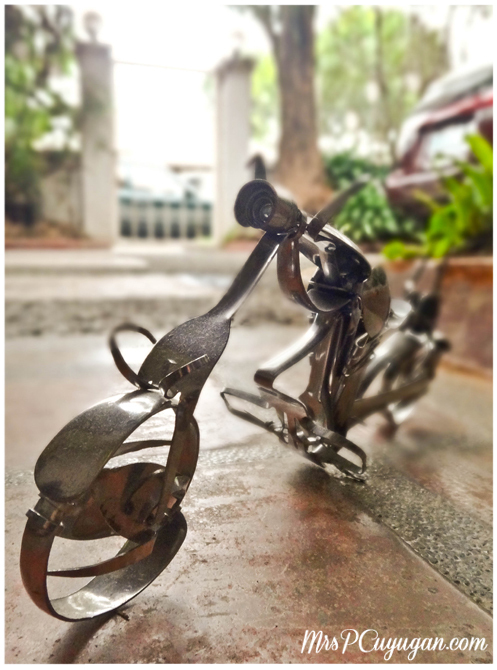 The motorcycle made of spoon and fork was really creative and you also were able to capture it nicely through your photo. That is one cool sculpture using utensils, I wonder if that artist can make other sculptures using utensils. Very nice bike and my motorcycles, actually I have motorbike blog. Thanks for posting. Haha. Bibo mommy, good job! I have to give this a second look. I scanned your photo the moment you posted it but now that I read this, I have to look at the photo for a longer time. I didn’t know it’s made of spoons and forks until you mentioned it. Gosh. Galing ng gumawa. He was so good to create a motorbike made of utensils. Really great! WOW, that is an amazing work of art. Ang galing! Do you ride your dad’s bikes? I’ve never been on a motorcycle but I could imagine how thrilling it must be. The closest I think, to riding a motorbike, is riding at the back of manong tricycle driver. hehe. Haha Vera! Believe it or not I can’t even ride a bicycle. Never learned! Sayang no? And here I thought I’d see a big, low-slung, badass motorbike.. lol. But your artwork motorbike is awesome anyway. You got a good angle actually. 🙂 Whoever did that is some seriously talented dude. wow,that’s a pretty impressive sculpture…I totally don’t understand what you mean by not getting the angle right, from where I’m standing it looks like a really awesome shot. Yes he does! Thanks, Melgie!